I left my house in the dark this morning. The electricity went out at 7:30, which I later learned was because I made the very American mistake of having the air conditioner and hot water heater on at the same time. My host family, a Vietnamese “auntie and uncle” in their late fifties, shuttled me and my motorbike out the door and into the daylight. I was soon amid the honking, swerving, harrowing traffic for which Hanoi is famous. Half an hour later I arrived at the Green One UN House, a brand new building that has brought all of the United Nations agencies in Vietnam under one roof. It’s part of the “One Plan”, an effort by the UN and the Vietnamese government to create a more unified, synergistic UN. 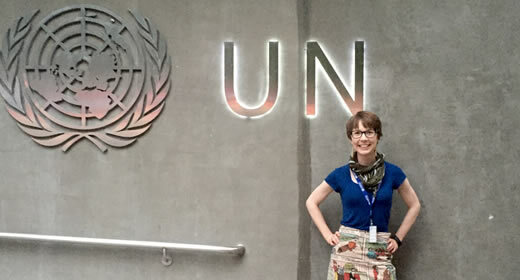 As a summer intern with the United Nations Population Fund (UNFPA) in Hanoi, I’m learning about endeavors like this one, gaining exposure to the complex interactions between the UN and the tightly-controlled, single-party state of Vietnam. I’m also witnessing a crucial transition: now that Vietnam is classified as a middle-income country, funding for organizations like the UN is shrinking, and their role in the country is in many cases being revamped. This is a great opportunity for immersion into issues facing a country that is developing so rapidly but that still faces immense challenges. I’ve found myself regularly applying lessons learned at Ford to understand these dynamics. My own projects at UNFPA, an agency that works to improve population health, are also infused with those lessons. This week I’m preparing for a workshop on aging issues with the National Assembly. Vietnam’s population is aging faster than previously projected, setting the country up for myriad challenges in the coming decades. My job this week is to translate data from the country’s General Statistics Office into fact sheets and policy recommendations for the National Assembly. Next week I’ll start an exciting new project: developing a proposed program on climate change for UNFPA Vietnam’s 2017-2021 cycle. UNFPA Vietnam has never worked on climate change issues, and yet climate change—expected to take a severe toll on Vietnam’s Mekong Delta and long coastline—will heavily impact the vulnerable populations the agency serves. My task is to identify a set of research questions and policy needs that fall within UNFPA’s mandate, that aren’t being addressed by other organizations or agencies, and that can produce the greatest possible benefit for groups like women and children, the elderly, and internal migrants. In my breaks from this challenging work, I’ll be stumbling through Vietnamese conversations with my warm (and ever-so-patient) colleagues, seeking new ways to avoid traffic jams, and exploring life as a Vietnamese daughter in Aunt Mai and Uncle Viet’s house. Internship field report submitted by Tarlise (Tarlie) Townsend (MPP '17). Townsend, who holds a BS in neuroscience and a BA in Germanic studies from Indiana University, is interested in the intersections of health, policy, and behavioral science. Townsend's internship is made possible by the Ford School's Annenberg Fund for International Policy Education and by the University of Michigan's International Institute and Center for the Education of Women.